Sever Stewart and Jack Gordon each won two individual events Thursday to help Faith Lutheran’s boys track team win a three-team meet at Bonanza. Stewart won the 110-meter hurdles in 15.81 seconds and the 300 hurdles in 40.69. He also ran on the winning 800 relay team. Gordon cleared 14 feet, 3 inches to win the pole vault and was first in the long jump with a mark of 18-8½ in helping the Crusaders total 101 points. Bonanza was second with 67, and Calvary Chapel was third with 14. Bonanza’s Cevion Gurka won the 400 (53.89), was second in the 200 and ran on the winning 1,600 relay team. Calvary Chapel’s J.J. Robinson won the 200 (22.76) and was second in the 100. Faith Lutheran baseball coach David Anderson said his team learned its lesson last week, when it took Rancho lightly and lost. The Crusaders certainly didn’t take Monday’s game lightly. Christian Dijkman and Michael Rice combined on a two-hitter as host Faith Lutheran downed defending state champion Palo Verde 4-1 in a key Mountain League game. “We gotta take care of business, and the only way we do it is by one pitch at a time, and that’s what we did today” Anderson said. “Baseball happened to us against Rancho last week. We were lucky to have Thursday, Friday and Saturday to work on one pitch, one at-bat and focus on just that one moment.” Faith Lutheran (11-5) moved into a three-way tie with Rancho and Palo Verde for first place in the Mountain League. All three teams are 6-1 in league play and have six league games left. Making just his second start of the season, Dijkman used a four-pitch arsenal to silence the Panthers. The 250-pound sophomore retired 10 of the first 11 batters and picked his spots to deliver off-speed pitches that kept the Panthers (16-3) off-balance. He allowed two hits, walked one and struck out three in five innings. Rice pitched two perfect innings in relief. The Crusaders added runs in the third and fifth inning, and Palo Verde got its run in the fourth. Sylvester was 2-for-3 with a double and a run scored, and Dylan Schafer scored twice for Faith Lutheran. Josiah Cromwick was 2-for-3 with a run for Palo Verde. Jacob Ortega was 3-for-4 with two doubles and two RBIs on Monday to help Faith Lutheran’s baseball team to a 7-4 win over visiting Arbor View. Sagan Gronauer was 2-for-2 with an RBI, and Shane Taylor went 1-for-2 with two RBIs for the Crusaders. Garrett Cutting and Dominic Clayton each went 2-for-3 for the Aggies, and teammate Nick Cornman was 1-for-4 with a home run and three RBIs. Quenton Rice, Sever Stewart and Allan Davis each won two events on Wednesday to lead Faith Lutheran’s boys track team to victory in a four-team home meet. Rice won the 100-meter dash in 11.34 seconds and took the 200 in 23.13. Stewart won the 110 hurdles in 16.82 and 300 hurdles in 41.23, and Davis cleared 5 feet, 8 inches to win the high jump and had a mark of 19-9 to take the long jump. The Crusaders had 108½ points to top Cimarron-Memorial 99½, Bonanza 44, The Meadows 12. Aidan Baughan won the 1,600 in 5:01.89 and was second in the 800, and Tyler Schoenwald won the 400 in 51.02 and was third in the 200 for Faith Lutheran. Cimarron’s Branden Smith won the triple jump (40-6½), ran on the winning 800 relay team, placed second in the 300 hurdles and third in the long jump. Bonanza’s Dario Calata won the 3,200 (11:39.75), ran on the winning 3,200 relay team and finished third in the 1,600. Kalsey Kekahuna-Lopes went 2-for-2 with a home run and two RBIs on Wednesday to lead Faith Lutheran’s softball team to an 8-3 home win over Cheyenne. Ellie Fried was 3-for-4 with two runs for the Crusaders. Giovanni Bojorquez was 2-for-3 with a double and two RBIs for the Desert Shields. 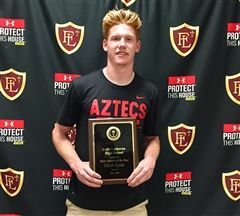 Elijah Kothe has been named the 2017-18 Faith Lutheran High School Male Athlete of the Year. Elijah signed his National Letter of Intent with San Diego State University to play football. 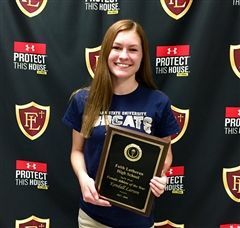 Kendall Larson is the 2017-18 Faith Lutheran High School Female Athlete of the Year. Kendall was also named NIAA Top 10 Scholar Athlete for the State of Nevada. Faith Lutheran boasts a proud tradition in athletics. Our teams have earned 42 State Championships and 33 State Runner-Up banners in our school’s history. We have won the Nevada Interscholastic Activities Association’s Award of Excellence in Academics, Athletics, and Citizenship an impressive six times. Currently, former Crusader athletes can be found on teams at The Naval Academy, USC, University of Kansas, Auburn, LSU, Duke, Boise State, Princeton, University of Minnesota, Northern Arizona, Denver University and Concordia University to name a few. Our athletics program is constantly growing and improving, boasting a state of the art strength and conditioning center to help our hundreds of student athletes accomplish even more.